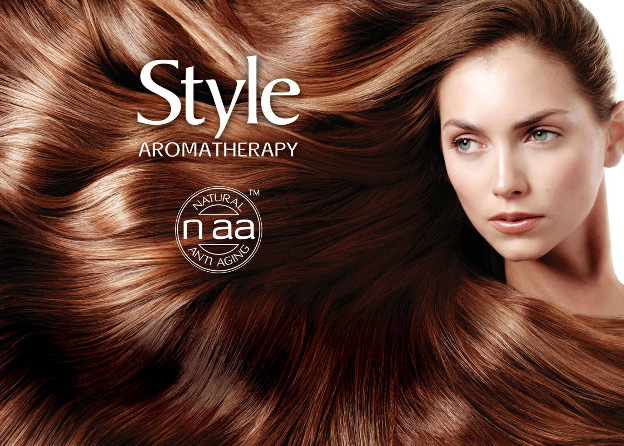 Style Aromatherapy Natural Anti-Aging The Natural answer to the ageing of scalp and hair. With the passing of time, scalp condition and the flexibility, strength, texture and appearance of our hair, tend to deteriorate and become unsightly. The anti-aging formula of Style Aromatherapy Hair Products delivers for the first time, a remarkably effective answer to the scalp’s specific needs, as well as solutions for every type of hair problem. Based on proprietary Style Aromatherapy Natural Anti-Aging technology “NAA” and fortified with Borage Seed Oil that has invaluable anti-aging properties, every product category contains pure essential oils able to provide a focused natural response to the specific needs of the body, hair and scalp.